Breakfast Pizza is a delicious meal option that you can prepare any time of the day. Use store-bought pizza crust to make this even easier to prepare. The Safeway deli has a fabulous Primo Taglio pizza crust in a traditional dough and in a whole wheat dough. We buy it often and make pizza at home with our own toppings. 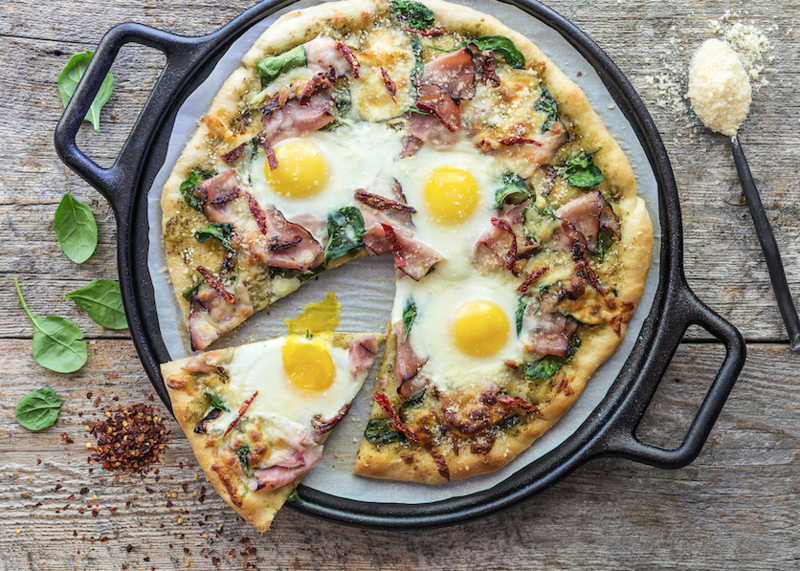 To make this Ham and Egg Breakfast Pizza, spread a thin layer of pesto over the pizza crust and top with sun-dried tomatoes, mozzarella cheese, thinly sliced ham, and finish off with eggs and chopped fresh spinach. You can add some red pepper flakes for a little heat and serve with freshly grated parmesan cheese! 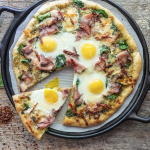 Use ingredients on sale at Safeway to make Ham and Egg Breakfast Pizzas for dinner this week. You can even serve with a side of Simply potatoes hash browns on sale to have a fabulous meal on the cheap! Lucerne eggs – just $1.79 for 18 ct. Spread dough evenly over pan. Spread pesto on dough. Top with spinach, sun-dried tomatoes and ham and cheese, leaving 4 small wells in the pizza for the eggs. Bake for 11 minutes. Remove pizza from oven and add eggs. Return to oven for 6-8 minutes, until the egg whites are set and crust is golden brown. Slice and serve. As with any pizza, this recipe is fantastic topped with parmesan cheese and crushed red pepper flakes for extra flavor! Crack eggs into individual bowls to add to the pizza. It saves time and assures no broken shell pieces make it to your pizza.